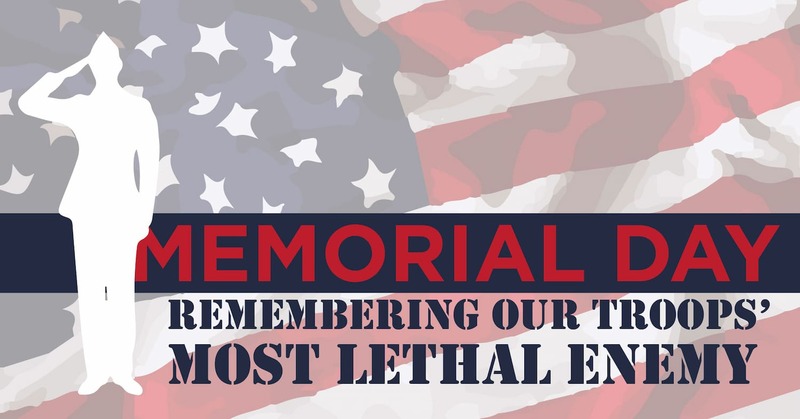 On Memorial Day, we remember those men and women who died serving our country as a member of the armed forces. Traditionally, the day is set aside to remember those who died in combat. We add to that tradition today, remembering those who died fighting for our country, even as they lost the battle to war’s deadliest opponent: Disease. War and disease have always gone hand in hand. It would surprise no one that the combination of overcrowding, unsanitary conditions, and weakened immune systems led to easier and deadlier spread of infection and disease. The extent to which disease impacted soldier health and survival is the truly shocking point: Up until WW1, in every war, all over the world, the enemy that claimed the most lives, by far, is disease. This ratio is not different in wars involving the United States, starting with the Revolutionary War. The crude medical practices of the 18th century cursed those fighting in the war for independence, even impacting the outcome of the war itself. While the exact casualties due to infection and disease are not known, they far, far exceeded those killed in battle. Historians' best estimate for total deaths of Americans in action is 6,800. Those killed by disease? 17,000. Those on the British side fared even worse. 4,000 British soldiers died in action, with 27,000 perishing from disease. While both sides faced familiar diseases in the colder Northern colonies, those in the Southern colonies were faced with tropical disease such as malaria, yellow fever, dengue, and typhus. It is believed that Lord Cornwallis abandoned his campaign in the Carolinas due to the illnesses sweeping through his troops, only to arrive in Yorktown for his fateful loss. Many historians believe that it was General Washington’s best decision to innoculate all American troops against smallpox – a decision that may have turned the tide and led to our independence today. Unfortunately, innoculations were not available for the diseases that would continue to claim shocking numbers of soldiers’ lives for the next 150 years. The War of 1812 claimed 20,000 lives, 15,000 of which were lost to disease. “Lake fever,” typhoid, pneumonia, malaria, measles, and even smallpox would claim over 12,000 lives during the Mexican American War – 98.5% of that war’s casualties. The American Civil War, our nation’s deadliest conflict, showed an improvement, but still 68% of deaths were due to disease. Dysentery was the most lethal enemy, responsible for over 100,000 deaths alone. This broad term describes the digestive infection resulting in severe diarrhea, fever, dehydration, and death. Stemming from any number of microorganisms, this condition was a direct result of drinking water contaminated with human waste, use of cooking pots to both prepare food and soak clothing, and lack of sanitary medical care. Typhoid, which led to 65,000 deaths, was also transmitted through contaminated water or food. Other opportunistic diseases spread easily in the cramped living conditions, including measles, tuberculosis and malaria. All told, at the end of the Civil War, over 420,000 soldiers had died not from bullets but from bacteria and other pathogens. This trend of deaths by disease continued with strength up until WWI, when advances in medical care and in the understanding of disease transmission and sanitation finally began turning the tide. Despite these advances, 48% of deaths during WWI were due to disease, 30,000 of them claimed during the Spanish Flu pandemic of 1918. Three advances in the ensuing decades would finally change the impact of disease and infection on the survival of American soldiers going to war, and all of them would impact our ability to achieve victory in WWII. First, let’s look at just what a difference in % of soldier deaths caused by disease rather than combat. What caused that incredible drop? Antibiotics. The ability to treat infections of any kind, from wounds to respiratory to digestive, with a reliable medicine immediately reduced deaths. Vaccinations/Immunizations. WW2 was a significant factor in the creation of many of the first vaccines, including the first flu vaccine. The US government, universities, and labs, foundations, and the medical industry worked together to quickly create, test, and distribute vaccinations to help protect soldiers' lives. Faster evacuation. Alongside the medical advances that saved soldiers’ lives, the introduction of air evacuations of wounded proved tremendously helpful, especially in the Pacific theater. Getting wounded soldiers to medical care faster saved countless lives. After WW2, the modern era of warfare – and disease control and prevention – had truly arrived. Never again would American soldiers be at risk of perishing from disease, an enemy they couldn’t even defend themselves from. While disease still affected our war efforts, the scale was much smaller. Tragically, the greatest impact of disease was felt by prisoners of war, whose deplorable conditions and lack of medical care put them back 100 years in terms of disease survival – POWs in Korea, for example, were not protected from tuberculosis, infection, and even the age-old killer, dysentery. 65.8% of those who died as POWs died from infections disease. Soldiers in the Viet Nam War also faced disease as POWs, albeit to a lesser extent. So are diseases and infections no longer a significant concern for today’s modern military? Absolutely not. While medical advances have improved tremendously, including the mobile medical units that premiered during the Korean War, a new enemy is growing stronger: Antibiotic resistant organisms. One in particular, a strain of Acinetobacter baumanii, has become a significant issue to veterans injured in the Iraq and Afghanistan battlefields. Nicknamed “Iraqibacter” due to its increased incidence in these wounded soldiers, this antibiotic-resistant bacteria is thought to be purely nosocomial, that is, it is a hospital-acquired infection. Soldiers wounded in Iraq or Afghanistan are transferred to a variety of hospitals as their symptoms improve, making the spread of this strain quicker and more efficient. Additionally, at every step along the way, the extensive use of antibiotics has impacted the strain’s resistance, making it responsive to only the strongest available treatments. Efforts are underway to curb the use of antibiotics, screen patients for colonization, and monitor environmental factors at all the facilities, but there is still much work to be done. Antibiotic stewardship may be the next medical advance to protect our troops as they fight for our nation around the globe. If we allow antibiotic resistance to grow unchecked, eventually we will get to a time when our troops must face, yet again, the hidden enemy of infection and disease. Let us always remember what those days were like, and do our part in making sure they never return. What a wonderful way to remember and honor our fallen heroes.